The high flexibility of our software allows one to do quite sophisticated calculations. 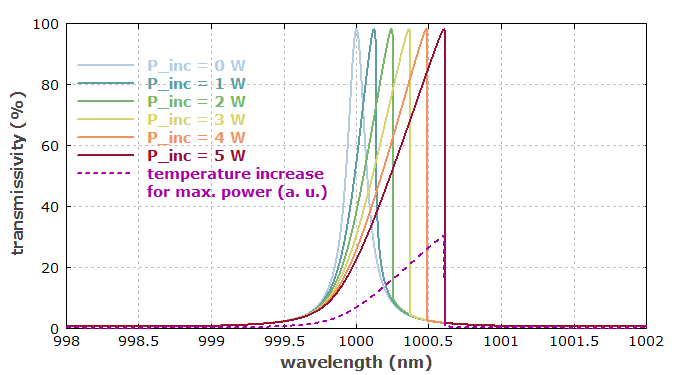 As an example, we analyze a case where the optical power in a structure leads to heating, while the resulting temperature change affects the optical behavior, thus also the heating power. One needs to iteratively calculate a steady state of the system. This version is not yet perfect in terms of convergence to the steady state; therefore, a demo file supplied with the software has a somewhat more refined version which uses variable damping of the temperature evolution. 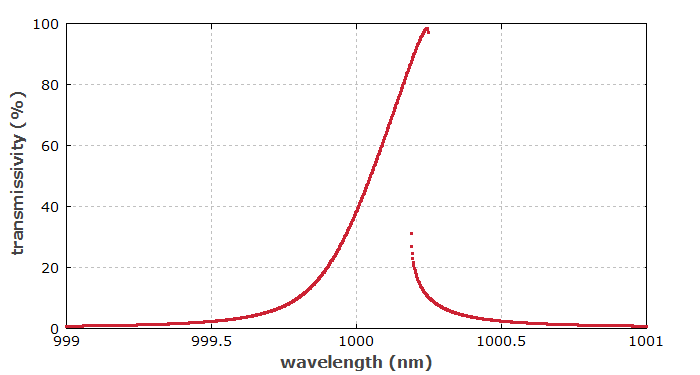 When starting at short wavelengths, one can obtain high transmission around 1000.25 nm, where resonance is obtained only due to the strong heating. However, when starting at long wavelengths, the system stays in a low-transmission state for the same wavelength of 1000.25 nm. Such bistable behavior is often observed in such systems. In our example case, it disappears when we reduce the number of Bragg layer pairs per mirror from 4 to 3.